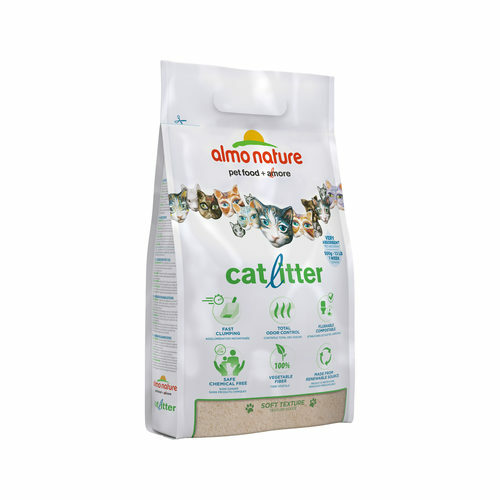 The litter from Almo Nature is a natural cat litter made from vegetable fibres. These fibres are natural and biodegradable. The starch in these fibres produces clumps quickly and the enzymes ensure that odours are neutralised. The litter tray filling from Almo Nature is a cat litter based on natural ingredients with vegetable fibres. These fibres contain enzymes and starch that ensure that clumps are quickly products and that bad odours are neutralised. This reduces mess and keeps the litter tray clean. The clumps ensure that only the top layer needs to be removed when cleaning the tray. This also removes the risks of a clogged cat toilet, as the clumps dissolve when they come into contact with water. Aside from the above benefits, there are also economic advantages to this litter. Creating a base layer of litter (2cm) only takes half of contents of the bag of Almo Nature. As soon as the base layer is made, the weekly use is estimated at approximately 500 grams. Have you used Almo Nature Cat Litter before? Let us know what you think about this product.